MELISSA: Truffles! Come here, sweetie. What's all the commotion for? TRUFFLES: Mommy! Grandpa's in the kitchen getting the turkey ready for Thanksgiving dinner. It's gonna be soooo good. I can hardly wait! MELISSA: Come sit on my lap for a minute. I want to talk to you. TRUFFLES: (bounces up) What's up, Mommy? MELISSA: Turkey sure is a special part of Thanksgiving, I agree. But the real meaning of the holiday is to think about our blessings and all the things we're thankful for. TRUFFLES: What are you thankful for, Mommy? TRUFFLES: Oh Mommy, I love you too. (Purr...) A few months ago I was homeless and now I have so much - yummy food and treats, warm beds, toys, and most of all a Mommy who loves me so, so much. MELISSA: I guess we're pretty lucky we found each other, aren't we? TRUFFLES: You know what I'd like to do after dinner, Mommy? MELISSA: Take an extra long catnap? TRUFFLES: No, I'd like to take a big bowl of extra turkey to all the kitties and doggies in the shelter that are still waiting for their forever home. MELISSA: I think that's the best idea I've heard in a long time. Why don't we go out to the kitchen and see what we can do to help out? I'm with you turkey turkey turkey!!! 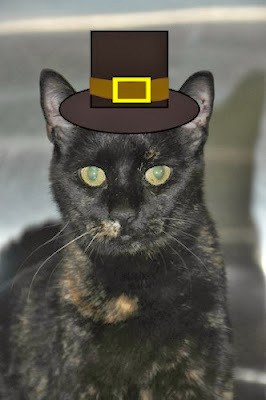 Happy Thanksgiving Melissa & Truffles "Turkey & Giving Back sounds wonderful"
Happy Thanksgiving Melissa & Truffles!!! !